July 16, 2018, Cairo, Egypt. 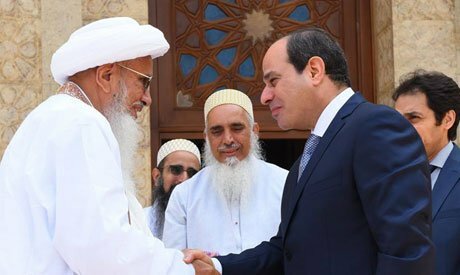 Egypt’s President Abdel-Fattah El-Sisi received on Monday the Indian leader of the Dawoodi Bohra sect. El-Sisi welcomed Sultan Mufaddal Saifuddin, stressing the historical ties between Egypt and the Bohra community and hailing the sect’s constant openness to all religions and sects and the deep belief in the importance of dialogue among all peoples of the world. During their meeting, the president praised the efforts of the Dawoodi Bohra community in Egypt to restore ancient mosques. The Dawoodi Bohra community has already restored the famous Fatimid Al-Hakim Mosque, as well as the Juyushi Mosque, Aqmar Mosque and Al-Loloa Mosque in Cairo. Sultan Mufaddal Saifuddin also discussed in his meeting Egypt’s progress in achieving security and stability during the past period under the leadership of El-Sisi. He praised Egypt’s freedom to practice religious rituals and ensure a stable atmosphere for all sects. El-Sisi also met with Saifuddin’s brother and his sons, Hussain and Jafar Al-Sadiq, as well Mofadal Hassan, the representative of the Dawoodi Bohra sultan in Egypt, the statement read. The Dawoodi Bohras are a sect within the Ismaili Shia branch of Islam. While the sect is concentrated in India and Pakistan, Egypt has been home to a Dawoodi Bohra community since the 1970s.